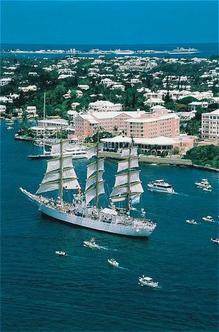 Majestically situated overlooking Hamilton Harbour is Bermuda's reigning grande dame, The Princess. This elegant pink palace, named for Princess Louise has been welcoming visitors to Bermuda for more than 100 years. The hotel features swimming pools, fitness centers, putting green and a selection of restaurants renowned for their fine cuisine. Guests also have access to all facilities at the Fairmont Southampton , just 20 minutes away via a private ferry. In addition, The Fairmont Hamilton Princess is just a short stroll from the quaint capitol city of Hamilton with its shopping treasures and superb restaurants. A scenic selection of gardens, terraces and outdoor patios is perfect for festive gatherings, large and small. The meetings staff at The Fairmont Hamilton is known for their personal involvement and attention to detail, working closely with meeting planners to create memorable theme parties and meetings.